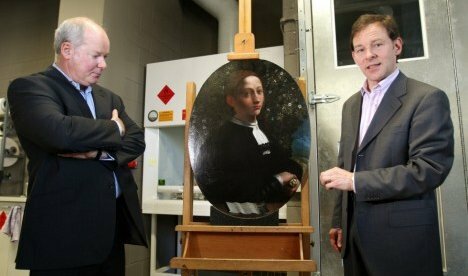 So in the opinion of the conservator the sitter was female. The next questions to be answered were who was she and who painted the portrait. After two years of intense scientific analysis and research in Italy, Australia and America the art curator and conservator, Villis came to the conclusion that the female was no other than a young Lucrezia Borgia, the daughter of Pope Alexander VI and brother of Cesare Borgia and furthermore the artist was Giovanni di Niccolo de Luteri, or as we now know him, Dosso Dossi. So why Lucrezia Borgia? Villis postulated that because the female figure in this painting is holding a dagger the depiction alludes to the Roman heroine Lucrezia, who after being raped by Tarquin, the son of the King of Rome, killed herself with a dagger so as to protect the honour of her family. 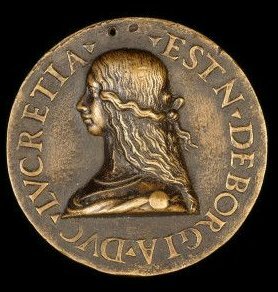 They also likened the depiction to the 1502 coin which was adorned with Lucrezia’s profile. Maybe these are good arguments to make Lucrezia the woman in the painting but what made them believe the artist who painted her portrait was Dossi? The belief that he was the artist followed an analysis of the painting’s pigments and the artistic style which indicated that it was likely to have been painted by Dossi. Dossi ,if you remember from Part 1 of this blog, came from Ferrara as did Lucrezia. In 1502 the twenty-two year old Lucrezia married her third husband Alfonso I d’Este, Duke of Ferrara, who later employed Dosso Dossi as the court painter – a coincidence ? Maybe, maybe not! The gallery awaits authentication by external scholars and art history experts and are right to be wary of being too dogmatic with regards their discovery as in 2007 the National Gallery of Victoria was embarrassed after it was revealed that it had wrongly attributed a painting by an unknown Dutch painter to Vincent van Gogh ! 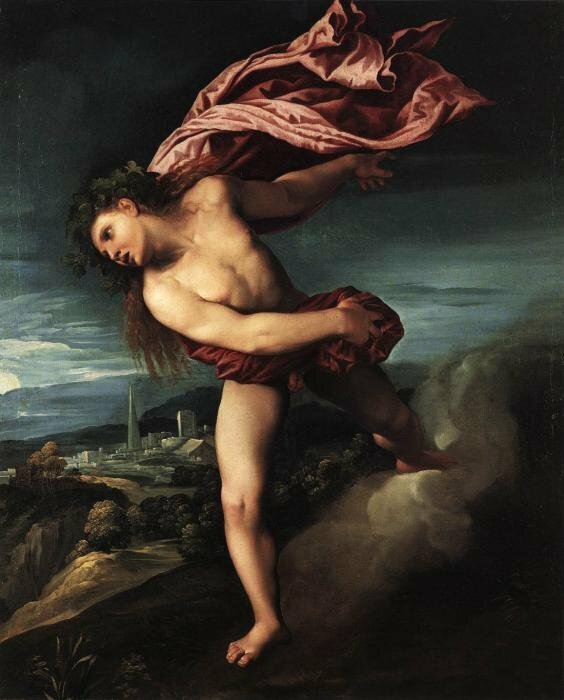 Dosso Dossi was a contemporary of four great High Renaissance Italian artists, Raphael, Leonardo, Michelangelo and Titian and it is because of one of their famous works of art, Titian’s Bacchus and Ariadne that Dossi came to complete his own work, Bacchus in 1524. In 1523, Titian finished his painting entitled Bacchus and Ariadne which is now housed in London’s National Gallery. The commission for Titian’s work was one of a cycle of mythological works, which he and Giovanni completed for Alfonso I d’Este, Duke of Ferrara, and it was to be hung in the Camerini d’Alabastro, a private room in the ducal castle. Originally this part of the commission was given to Raphael who had made plans and sketches for what was to be his Triumph of Bacchus but he died in 1520 and Titian was given the commission to complete. In the left of the painting we see Ariadne who has been abandoned on this island of Naxos by her lover Theseus, who has sailed off. The white sails of his boat can be seen in the extreme left background. In the painting we see Bacchus, the god of wine, leaping energetically from his chariot which is drawn by two large cheetahs. His followers and fellow revellers appear, emerging from the forest in the right of the picture. Bacchus is immediately smitten by the sight of Ariadne, who steps back in fear of his sudden arrival. He promises to turn her into an eight-star constellation, which we see halo-like in the sky, above her head. This beautiful painting from the Venetian School painter Titian is awash with beautiful colours, blues, reds and browns which enhance the mythological scene. Dosso Dossi was a contemporary of four great High Renaissance Italian artists, Raphael, Leonardo, Michelangelo and Titian and it is probably due to the popularity of Titian’s work that he was commissioned to copy part of Bacchus and Ariadne, a commission he completed in 1524. 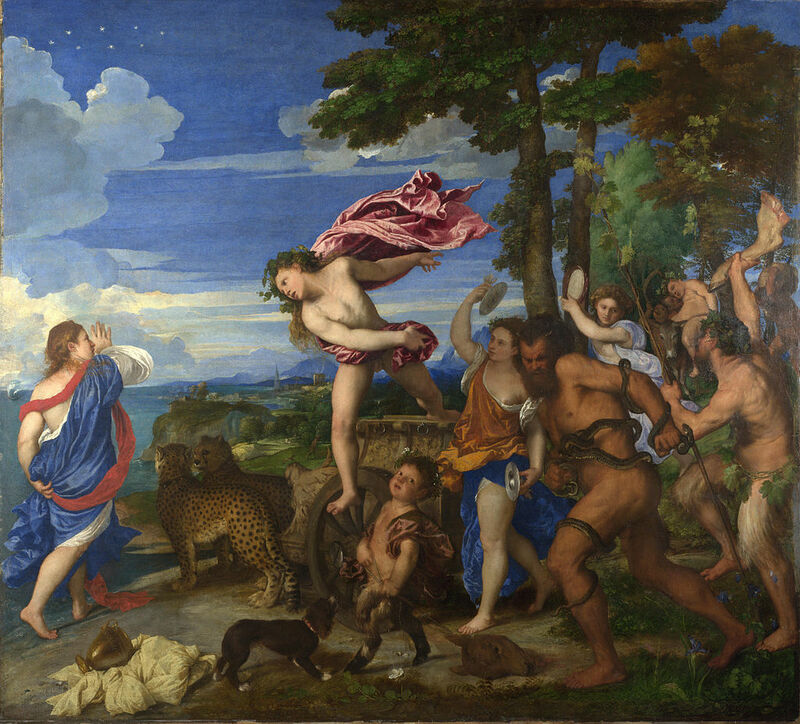 The painting was simply entitled Bacchus and is a copy of the central character in Titian’s painting, with just a few small changes to the background landscape. The painting probably came about through a commission given to Dossi from an admirer of Titian’s work, which he or she saw when it arrived at Ferrara the year before. 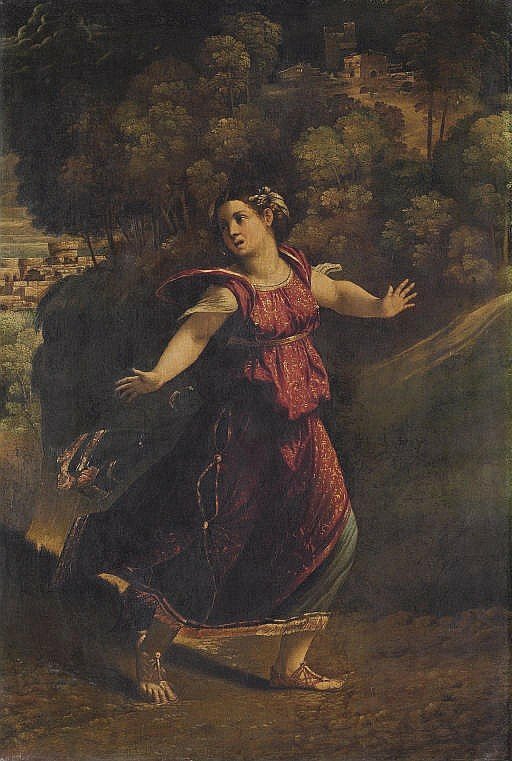 Another of Dossi’s paintings featuring Ariadne is entitled A Woman Fleeing on a Wooded Path. 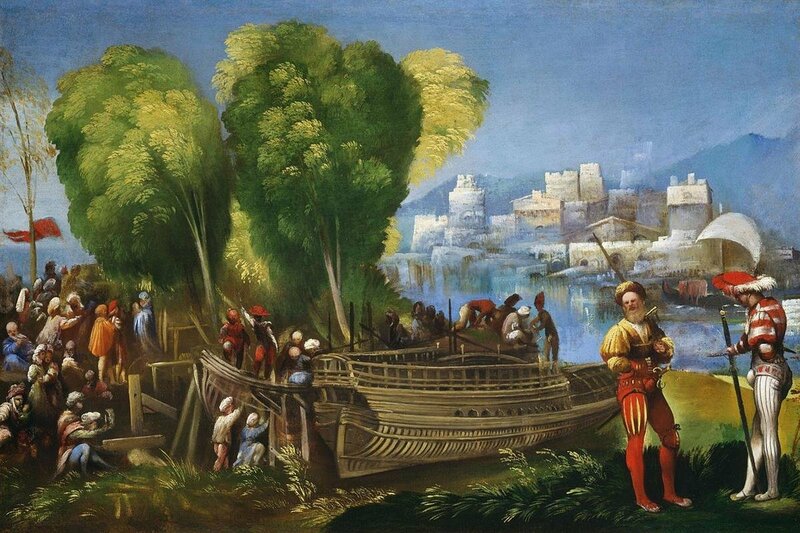 This work at one time was thought to have been painted by Dosso Dossi’s younger brother Battista but now is generally believed to have been painted by Dosso himself because of the forms and the drapery, and the detail of the landscape, particularly the buildings in the upper right section. The female figure has since been identified as being of Ariadne as noted in the lists of paintings by the influential scholar of the Italian Renaissance, the art historian Bernard Berenson. Much has been said about the ducal palace of Alfonso I d’Este, the Duke of Ferrara and the art that graced the walls of his palace. In fact, by 1529, he had managed to create the most magnificent private art gallery of his time, including several masterpieces by Titian, hung as an ensemble. The Duke’s gallery, known as the camerino d’alabastro with its alabaster walls and gilded ceiling, contained the finest sculpture and paintings that money could buy. The power and wealth of Duke Alfonso allowed him to commission paintings from the most famous artists of the day. The elderly Giovanni Bellini completed the Feast of the Gods in 1514, which was the last painting he completed before he died. Sadly both Fra Bartolommeo and Raphael died before completing Alfonso’s commissions and so as we saw with the painting Bacchus and Ariadne the Duke turned to Titian who was still only thirty years old and though he was a student of Bellini he was still not famous. In 1514 Alfonso commissioned Dossi to produce ten paintings for his Camerino d’Alabstro. These works were to illustrate scenes from the twelve books of Virgil’s epic poem, Aeneid and would be so hung, high up on the walls, so as to imitate a frieze. 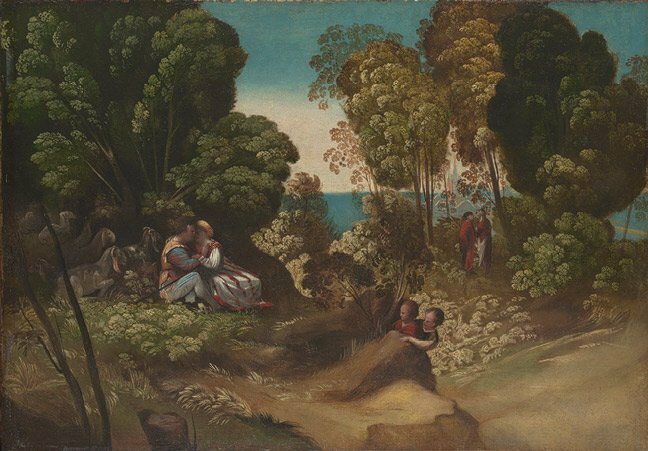 The first painting I have featured from this set, which is part of the National Gallery of Canada collection, is entitled Aeneas in the Elysian Fields and it illustrates a scene from the sixth book of the Aeneid. In the work of art, we see Aeneas in the far left of the painting with his plumed hat, carrying the golden bough, and accompanied by the Cumaean sibyl as they arrive at the Elysian Fields. The second of the three surviving paintings from the “frieze” is entitled Aeneas and Achates on the Libyan Coast. This work is housed in the National Gallery of Art in Washington. The depiction is based on the first book of Virgil’s Aeneid which is all about the story of Aeneas, who after the fall of Troy and seven years wandering, founded a settlement on the Italian peninsula, establishing the Roman state. In Book 1, Aeneas and his faithful companion Achates, having only just started their journey, and are forced to take refuge on the Libyan coast after their ships are wrecked in a storm. 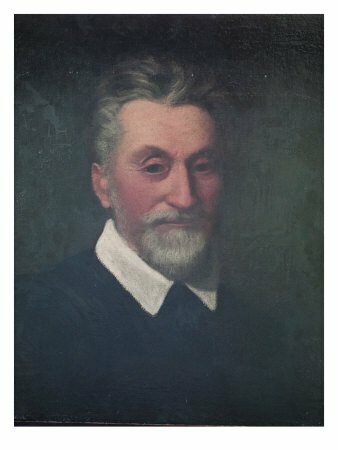 Dosso Dossi worked for the Dukes of Ferrara for almost three decades. He died in 1542. 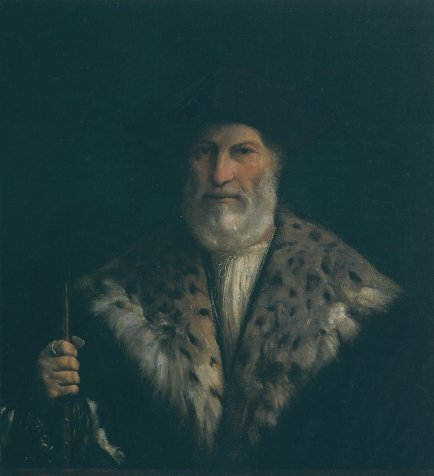 His brother Battista who had taken over the mantle of chief court painter to the Duke of Ferrara on his brother’s death, died six years later. In my last blog I looked at the lives of two American landscape artists, Marion and Elmer Wachtel and for many people outside of America these painters may have been completely unknown. Today in my blog I want to introduce you to a great painter who may also be unfamiliar to many. Today let me introduce you to the Italian High Renaissance painter Giovanni di Niccolò de Luteri who became known as Dosso Dossi. Dossi was born in St Giovanni del Dosso, which is a small village thirty kilometres south west of Mantua. His actual birth date is something of a mystery with various historical documents and biographers disagreeing, albeit a consensus of opinions puts it at around 1487. His early upbringing is also somewhat shrouded in mystery. However we do know Dossi had a younger brother, Battista, who was also a painter but said to be not as talented as his older brother. We also know that his father, Niccolò de Luteri, was a native of Trentino, an autonomous northern province of Italy, close to the Austro-Italian border. His father was a member of the Ferrara court of Duke Ercole I d’Este the Duke of Ferrara and later, after his death in 1505, his son Duke Alfonso I d’Este, the Duke of Ferrara. His role was that of a spenditore, a bursar or land agent for the court and it was the name of the Duke’s property, Villa Dossi, which lent its name to his two sons. There is much conjecture about Dossi’s early training. Giorgio Vasari believed Dossi studied under Lorenzo Costa in Ferrara whilst others say he studied in Venice. Dossi’s seventeenth century biographer, the priest, poet and writer, Girolamo Bruffaldi, wrote in his 1704 book Vite de’ pittori e scultori ferraresi (Biogrpahy of Ferrara artists) that Dossi studied in Rome and Venice. Records show that Dossi was working for the House of Gonzaga in Mantua in 1512 and two years later was working as a court painter in Ferrara at the court of Alfonso I d’Este, and later his son Ercole II d’Este. As a court painter Dossi’s time would have been spent decorating the private residences of the Court with large frescoes and paintings, often detailing historical or mythological themes. Court painters of the Renaissance, like Dossi, would have been asked to provide designs for elaborate tapestries and conjure up theatrical sets and backdrops. There would have been many portraiture commissions to carry out featuring the Duke and his family as well as portraits of the family members of the wealthy courtiers. In his early days at court Dossi was sent by the Duke to Venice, Florence and Mantua. 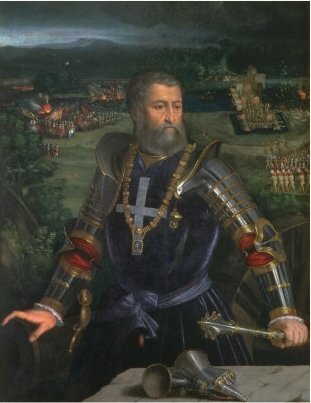 The Duke also sanctioned Dossi and his brother Battista to produce altarpieces and secular works for the local nobility and princely patrons, such as the Duke of Urbino and Cardinal Bernado Bles the prince-bishop of Trent. One of Dossi’s first tasks as a court painter was a collaboration with the painter, Benvenuto Tisi, known as il Garofalo. 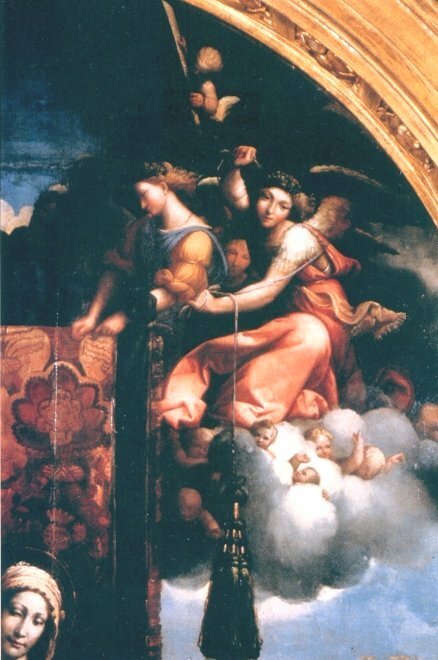 Garofalo, who had been living in Rome, where he had once studied under Raphael, received an invitation to come to Ferrara and complete a commission from the Duke of Ferrara to decorate a small chapel. On completion of the commission he was approached by Antonio Costabili to decorate an altarpiece. Antonio Costabili was a Ferrarese soldier, nobleman and diplomat and prominent figure at the court of Alphonso I and was a leading patron of the arts. 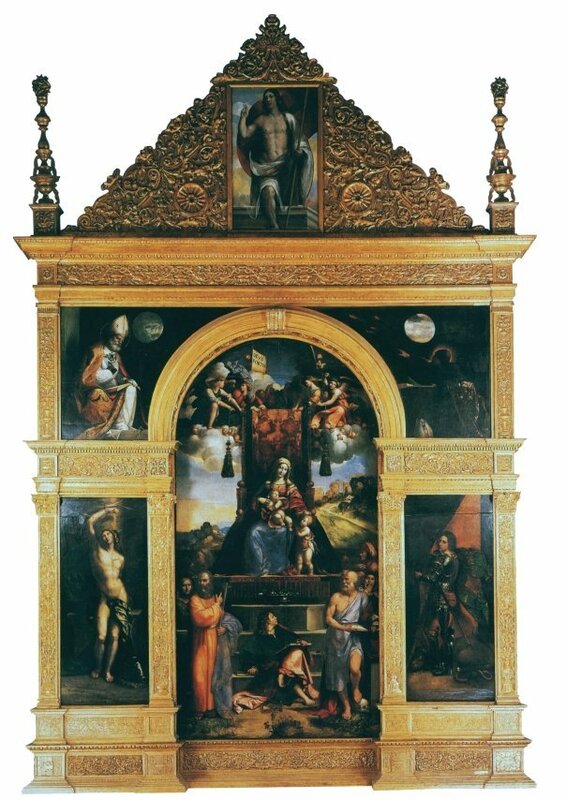 The commission taken on by Garofalo and Dossi was the polyptych, which became known as the Costabili Polyptych. It was for the high altar, which stood at the rear of the chancel, raised above the choir stalls of the Augustinian church of Sant’ Andrea in Ferrara, which was home to the Ordo Eremitarum Sancti Augustini, the order of the Augustinian Hermit monks. This was an order of monks accepted into the Roman Catholic family by Pope Alexander IV in 1256. The completion date of this magnificent work is contested by art historians but one clue as to the date is that Vasari wrote that the polyptych was completed prior to the death of Raphael and he died in 1520. 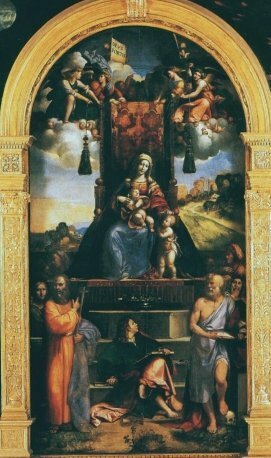 It should be remembered that Vasari, on two occasions, met with Garofalo in the 1540’s and therefore should have had accurate knowledge with regards the completion date of the altarpiece. Others narrow down the completion date to around 1514. 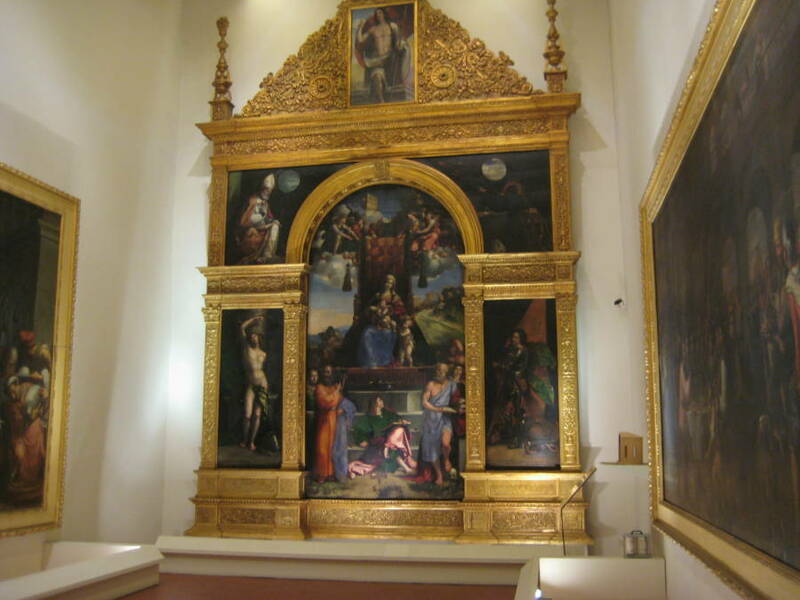 The altarpiece is now housed in the Pinacoteca Nazionale of Ferrara. The paintings are still in the original altarpiece’s wooden frame but there has been much work on reconstructing it as it was badly damaged during World War II. 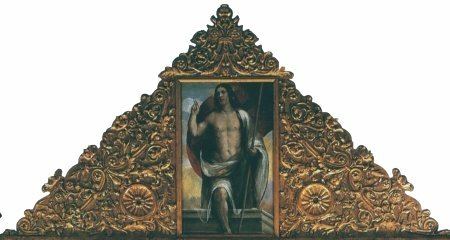 The altarpiece measures 31ft 6 inches high and 19 feet wide (9.6 x 5.8m). The main central panel measures 174 inches x 96 inches (474 x 262cms) and features the Virgin Mary enthroned with the Christ Child. Alongside her throne, on the right, is the infant Saint John the Baptist. Above the throne, on either side there are angels and spiritelli. Saint John blessed the cup of poison, neutralizing it and was then able to drink the liquid. In the right foreground of the central panel we have Saint Jerome holding an open book whilst his foot rests upon a skull. In the left foreground of the central panel we have Saint Andrew, the titular head of the church, who holds a cross and points towards the Virgin. The two side panels of the polyptych depict two further saints. Saint George, the patron saint of Ferrara, is featured in the lower right side panel whilst Saint Sebastian, the popular saint who was looked upon as a protector of the people against the plague appears in the lower left side panel. Above these side panels there are two spandrels. A spandrel is the almost triangular space between the left or right exterior curve of an arch and the rectangular framework surrounding it. 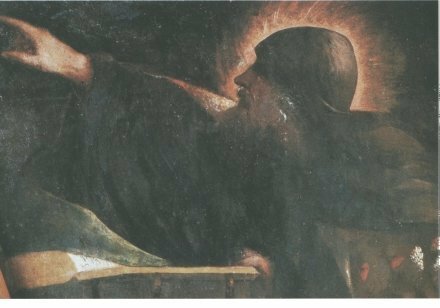 Saint Augustine, the patron of the Augustinian order can be seen in the right spandrel dressed as a hermit in the robes of an Eremitani friar with his bishop’s mitre on the floor by his feet and Saint Ambrose appears in the left spandrel with a manuscript resting on his lap. His demeanour is one of contemplation as one hand rests on his breast as he studies the text. Both spandrels have in the background an oculus window through which comes the light which illuminates the two saints. The resurrected Christ is displayed within the pediment at the top of the polyptych. This is a truly remarkable work of art. At first sight it would appear that the Saints that have been depicted were just a random selection but having read Dosso Dossi, Garofalo, and the Costabili Polyptych: Imaging Spiritual Authority by Giancarlo Fiorenza he believes they were chosen very carefully and he goes into great detail in his article about the reasoning. The article appeared in The Art Bulletin Volume 82, No.2 (June 2000). It was from this complex article that I got most of my facts about this work but I decided to steer clear of the theories about the inclusion of the saints and other symbolic aspects of the polytypch and will leave you to seek out the article if you want to delve further. 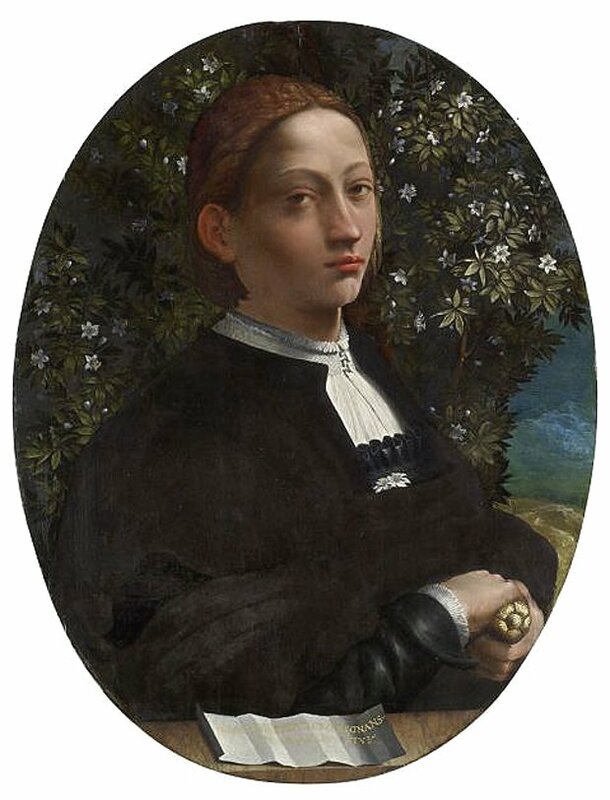 In my next blog I will look at more of Dossi’s paintings and look at one of a young man which is now believed to be a portrait of a famous young woman !